Happy New Year Internet People. I thought I’d start out the year with a nice recipe post in my favorite series of posts I do on this blog, experimental hops. This is the 10th experimental hop in this series, follow the link to see all of them. So, in the past few months, the number of people who follow and subscribe to this blog has almost tripled. I don’t know why, I’m not sure I deserve it, but I think that means my posts should have a little more introduction, at least for now. This blog is about exploring the science of beer through simple “experimentation” and research (scientific literature searching). Sometimes I write about microbiology of beer, sometimes I explain why pellicles form, sometimes I just post recipes that I’m working on. These experimental hop posts are about making a single hop saison using a “new” hop that most people haven’t used or in some cases heard of. When (and if) the hop gets an actual name, I try to go back and update the post. If you hear of an experimental hop getting a real name, please let me know. When I first started this blog a few years ago, I had been brewing for almost 10 years. At the time, I was almost exclusively brewing saisons and most of them were “hoppy”. I thought it would be interesting to do a series of single hop beers with known commercial hops, partially for my education and partially so I could write about hops. I quickly realized that people really wanted to hear about the unknown varieties rather than read about another single hop Simcoe anything. I still post when I make a citra saison, or a saaz saison but over the years I’ve gravitated toward the odder hops. Again, this is for my own education and to generate traffic for this blog, that’s more cynical than I meant it. The most common question I get whenever I post these are “Why did you make a saison?” or the cousin of that question, “Why didn’t you do a SMASH beer with a neutral yeast?” The answer is simple, because I want to drink the beer that results from this batch. And I enjoy drinking saisons. I don’t think the various strains I use mask much if any of the hop flavors, I’m using 8 ounces in a 5 gallon batch typically. I’m not worried about losing the hop flavor, and if it can’t stand up to a common yeast, that’s valuable information as well. Enough introduction, today I’m talking about ADHA529. For those that don’t know, ADHA stands for the American Dwarf Hop Association. ADHA is an organization that is dedicated to breeding new variety of hops to meet the agricultural challenges faced by hop growers currently. Well, that’s what I think they do at least. ADHA529 is the plain name they gave to a variety released for commercial sale in 2016. ADHA529’s parentage is known (sort of), which is always awesome when it comes to hops. I’d expect this from a breeding organization. The parents of ADHA529 are Zeus (mother) and wild father. This puts 529 in the Nugget family of hops (Nugget is the parent of Zeus). There are a lot of great hops in the Nugget family. You may know that Mosaic has a similar parentage. Seeing the parentage of this hop made me pretty excited. Based on these numbers, this hop should be pretty bitter and somewhat aromatic. 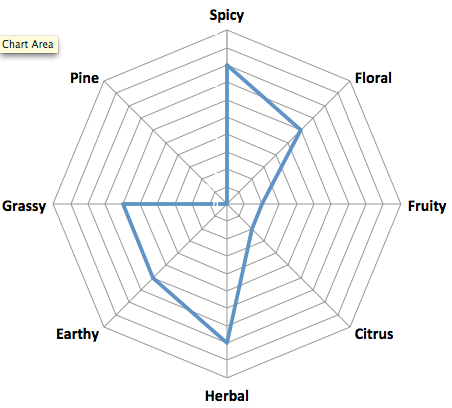 I’m currently working on a post that explains how to read these analytical readouts of hops. I guess onto the brew. This beer was fermented with a new pitch of WLP566 Saison Yeast II. Have to restart the cultures sometimes. This was a standard brew day for me. Nothing to report. One nice thing about making the same beer over and over again, is that they all look the same. 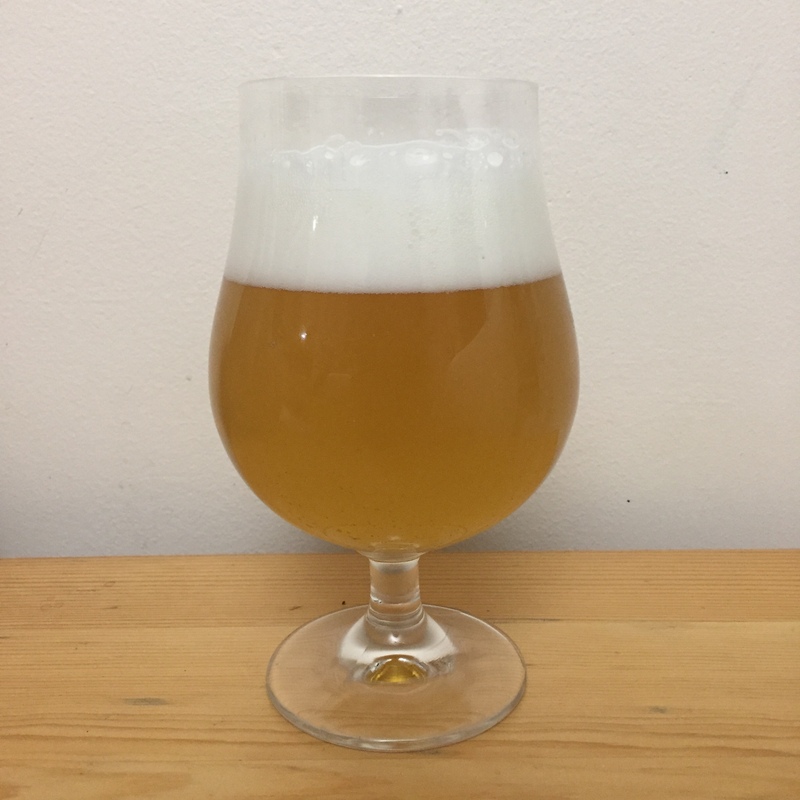 Beer is yellow and has a mild hazy to it, stiff white head of small and medium bubbles. Nice retention, decent carbonation (I force carbed this beer to about 2.4 volumes). All of these beers look like great beers to me. Some of these hops I love using, some not so much. The aroma of a hop is so important. I think the battle between something being good and great is won or lost at the aroma stage. If the aroma of the beer isn’t great, the beer will never be great. In the parlance of science, aroma would be described as “necessary but not sufficient”. That’s poor foreshadowing I suppose but I don’t really like the aroma of this hop. This is by far the most “spice” and “tea” like hop I’ve ever used. I don’t want to describe the aroma as “bad”, it is just not what I like. Some hops can get into the “mint” area of flavors, this one definitely does. The aroma revealed the flavor of this beer, as aromas often do. This beer is minty, grassy, spicy, tea-like in the flavors. The saison yeast is lost in this beer entirely, which I guess means the hop is pretty aggressive. I don’t want to say that this is a bad beer, I drank a lot of this beer and got a real appreciation for what it was, it is just not likely that I’ll make this beer or perhaps even use this hop again. Below I profiled the flavors of the beer I created with this hop. There is no pine and nearly no fruit character at all. There is almost a coconut flavor to it. It is most, by far in my tastes, spicy, floral, herbal and earthy/grassy. The body and mouthfeel are fine. It is light and wet on the finish, the bitterness from the hop is pretty mild despite being above 10% AA. Maybe this would be a good bittering hop? There are already so many bittering hops though. I don’t think I’d make this beer again. There are a lot of process improvements I’m implementing this winter for more productive brewdays. I’m basically completely changing my process so I’ll probably just write about a typical brewday once that’s all said and done. I’m going to focus a little on hops for the first part of the year while I work on some microbiology posts as well. I’m back to brewing almost every week and I’m in the process of upgrading my equipment as well. I’m going to start doing 10 gallon batches so a lot of split batch experimentation happening. I have about 6 – 8 single hop saisons to get through, I have some barrel aged RIS I’m writing about currently and a pile of articles I want to summarize for you guys. My series of posts about owning Handsome beer company will also continue. All good things. I also got a new computer so hopefully I’ll get a lot more writing done. An american version of a lower aa polaris perhaps.